Oyster mushrooms look, smell and taste like oysters. They are commonly used in Chinese and Japanese dishes, but they have "jumped the pot" so to speak and are now used everywhere. The fragrant smoky-gray caps have a soft, chewy texture and are delicious cooked in omelettes, casseroles, pasta, kebabs, soup, stews. Try them in a simple stir fry with garlic, butter, soy sauce, white wine and rosemary. Contains statins which help to control cholesterol. 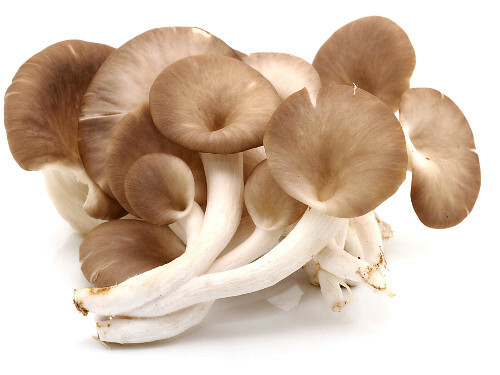 Oyster mushrooms are so effective at breaking down organic compounds they are being used for mycoremediation, the rehabilitation of contaminated soils. Easy to grow: we supply live colonies in ready-to-grow sawdust blocks. Complete instructions are provided.